The UAE’s free zones have been so much a part of the UAE economy that one can scarcely comprehend an economic landscape without the hubs. Some 36 such enclaves operate in the country embracing a scope as wide as one would want and the evidence is that the UAE could do with more of the same. Free zones have played a key role in globalising and diversifying the UAE’s economy within the free trade concept, said Minister of Economy Sultan Al Mansouri at a recent International World Free Zone Conference and Exhibition. He highlighted their role in stimulating trade and investment and facilitating the transfer of skills, knowledge and technology and asserted they would undoubtedly emerge as an essential and integral part of the national strategy for future economic development, playing a more significant role in global trade in general. “However, to be truly successful free zones have to offer more than just a place for business with relaxed regulations,” he suggested, expressing the view that they need to be established carefully in strategic locations. A helping hand from governments was imperative. They need to provide them with the right infrastructure and implement appropriate regulations for growth. The mushrooming of free zones in the UAE has done wonders. It has helped it become a leading Arab state for attracting foreign direct investment (FDI), flows of which increased from $4 billion in 2009 to $11.85 million in 2014. Back in 2000, the UAE had a small oil-dependent economy with a GDP of Dh383 billion ($104.27 billion) which progressively climbed up, growing by 286 per cent to Dh1.4 trillion in 2013,” said Juma Mohammad Al Kait, assistant foreign trade undersecretary at the Ministry of Economy. None will dispute that the free zones have significantly contributed to the national mission to diversify the economy. A much cited example of the UAE free zones’ success is the Jebel Ali Free Zone (Jafza). Last year it registered an increase of 17 per cent in the number of new companies compared with the previous year. Among the 679 companies that came aboard were top multinationals SMC Pneumatics, Sinoma Technology, XingXing Pipes, Lecker Food, and Novartis. The free zone has also posted a 10 per cent surge in its revenues for the year ended December 31, 2014. 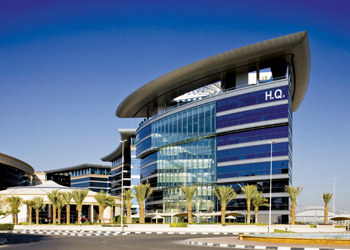 The operating profit rose by more than 13 per cent to Dh1.18 billion. “Jafza’s impressive growth in 2014 can be attributed to its focus on attracting quality investments in key sectors, prudent use of resources and achieving greater operational efficiency for itself and for Jafza-based companies by introducing new innovative products and initiatives,” said Salma Hareb, CEO of Jafza and Economic Zones World. Other free zones have also made notable gains. The Dubai Airport Free Zone Authority (Dafza) is set to announce 36 new warehouses in the Al Qusais area and other facilities close to Dubai International Airport’s Terminal 3. Its director-general said Dafza would for the first time lease land from the government to develop the warehouse scheme. Dafza officially stated earlier this year that it contributed Dh109 billion to Dubai’s non-oil foreign trade in 2014 and that its net profit grew 48 per cent with total revenues up 13 per cent. Sharjah Airport International Free Zone (SAIF Zone) is set to add 3 million sq m to the existing area of 6.1 million sq m of industrial and commercial land. It revealed its plans during its participation at Project Qatar, the 12th international construction technology and building materials exhibition that attracted over 32,000 visitors and 830 business-to-business (B2B) meetings. The first dedicated lifting webbing factory has opened in the free zone. The $20 million facility will manufacture nylon/ polyester webbing material ranging from 25 mm to 300 mm wide to meet the group’s in-house and market demands. 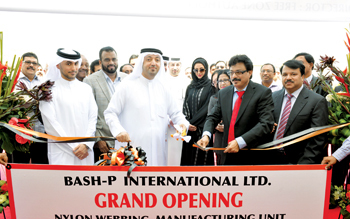 Bash-P International is the flagship lifting equipment manufacturing company of the Safety Services Group which was established in 1979 and is a conglomerate of establishments within the UAE, UK, India, Iraq and the GCC. Based at Papworth, Cambridgeshire (UK), Bash-P manufactures a wide range of products utilising foundries and quality eco-compliant facilities worldwide. SAIF Zone houses 6,800 tenants from149 nations, welcoming foreign investment from more than 500 firms. A significant development at the Ras Al Khaimah Free Zone was the inauguration earlier this year of Phase 2 of Streit Group’s Industrial Park developed for the armoured vehicles industry. The facility includes an Armoured Protection Glass (APG) factory to produce safety and bullet proof glass production, a state-of-the-art research and development centre, an international parts distribution warehouse and a Canadian Safety Solutions Training Centre. The hub is seeking large-scale investments from the US. A team led by RAK FTZ’s chairman, Sheikh Ahmad bin Saqr Al Qasimi, addressed entrepreneurs during a visit to the US, apprising them of the opportunities available for ventures in the free zone and the benefits that can be had. “The UAE and the US are long-term economic partners and enjoy a robust trade and investment relationship that has grown dramatically in recent years,” said Al Qasimi. “With one of the most open and dynamic economies in the world, the UAE offers an attractive proposition for US businesses and entrepreneurs, from service and trading companies to manufacturers and educational institutions, to gain traction in the Middle East region and access other potentially lucrative markets in Africa and South Asia,” he added. Over the past 14 years, RAK FTZ has rapidly expanded and is the investment destination of choice for more than 8,000 companies from over 100 countries, representing more than 50 industry sectors. The Khalifa Industrial Zone of Abu Dhabi has completed Phase 1 of the Kizad Logistics Park, covering an area of more than 45,000 sq m. All of its 41 warehouse units have been leased to national and international investors. Phase 2, which will add another 32 warehouse units, is expected to be completed this year. As part of a larger scheme, the logistics park, when finalised, will provide a total area of around 120,000 sq m and is designed to become a major regional logistics and warehousing centre. Kuwait-based Agility has chosen KLP as its logistics base as have United Printing & Publishing, one of the largest newspaper print companies in the UAE, First Gulf Bank, Al Kabeer Foodstuff, Galaxy Building Materials, Back Office Logistics, Oriental Fasteners, Protect Middle East, Creative Communication and Smart Design.